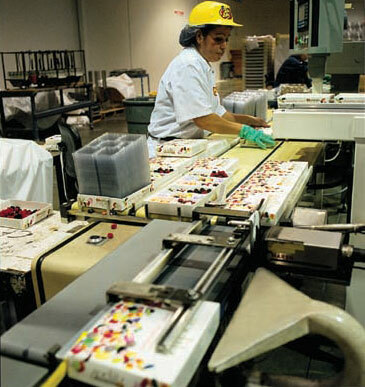 Combine an almost insatiable demand for America’s favorite gourmet jelly beans with a selection of over 39 flavors, and it becomes clear that the Herman Goelitz Co., makers of Jelly Belly, have to use every square inch of production space wisely. And with fourteen different packing lines running around the clock, space-saving equipment is critical to the plant’s operating efficiency. Dorner’s low-profile conveyors help this manufacturer maximize space efficiencies throughout the plant without compromising performance, capacity or reliability. The low height of the conveyor permits stacking one above the other. In fact, in places throughout the factory, you’ll find Dorner low-profile conveyors transporting three different products within the same space usually occupied by one conventional case conveyor. The compact design of Dorner low-profile conveyors not only help the Herman Goelitz Co., maximize every square inch of production space, they also help enhance worker ergonomics. Production line employees don’t have to stretch or reach as far. And with the number of conveyors now installed within close proximity to the production employees, they save time and steps when going from one assignment to another. Furthermore, Dorner’s superior reliability combined with a strict preventive maintenance program ensures the conveyors never disrupt the plant’s 24-hour production schedule.